Beetroot is a much under-rated vegetable. We are continually being asked for new beetroot recipes and this is the latest that we have tried and comes as a result of a request from our feedback. This free recipe makes a pleasant, sweet and fruity beetroot chutney that is not overpowering or excessively thick and heavy. 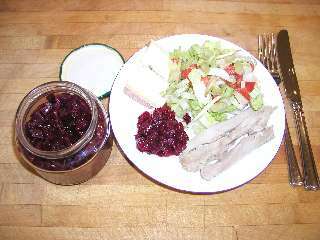 It makes an ideal chutney for eating with cheese, cold meat or traditional salads. Care needs to be taken during the final boiling process but the result is well worth while. We used beetroot bought at our local supermarket which was not strongly flavoured and we suspect that the flavour using home grown would be slightly stronger. We are always interested in our viewers opinion, particularly when it is a recipe that we have developed ourselves, so, if you try this, let us know the what you think. Other popular beetroot recipes on this site include beetroot curry, beetroot and orange salad and beetroot soup (Bortsch). 300g (10oz) of whole cooked beetroot cut into 5 - 6mm dice. Ours were boiled for 45 minutes in water, see here for instructions. 80ml of malt vinegar. Red wine vinegar may be used as an alternative with possible beneficial results. 1 large clove of garlic, extremely finely chopped or totally crushed. 2 tablespoons (30ml) of lemon juice. This recipe needs to be cooked in a stainless steel or other non-corroding type of pan with a well fitting lid. Aluminium types are best avoided as the acid content is quite high. Mix all the ingredients together into the saucepan making sure that there is at least 1" (2.5cm) of space at the top for froth and/or bubbles. Bring to a strong boil whilst stirring regularly. Stir continually at first to dissolve the sugar. Cover and simmer gently for 45 minutes, checking and stirring occasionally. Whilst simmering, prepare the jars. We use empty, clean jam jars that have the ant-tamper vacuum "dimple" type of lid. The lid and jar must be thoroughly washed and rinsed. We sterilise the jars in the oven at 120 degrees C. for 30 minutes and pour boiling water over the inside of the lid, dry thoroughly whilst hot and keep clean until used. When the chutney is cooked, pour carefully into the jars, seal with the lid immediately and allow to cool. We used a jam funnel (i.e. one with a wide neck) to assist in getting the chutney into the jars. When cool, check that the lid seal is good. This chutney should keep well unopened for months but once opened, keep it in the fridge. Note that, as with all pickles and chutneys, there is a possibility that the inside of the lid may become discoloured. If this happens, check the chutney before use and use immediately. If you have a recipe that you think will interest us, send it to us HERE. All recipes are provided free on an "as is" basis. For personal use only. Reproduction prohibited without permission. © oliver1.co.uk & oliver1.com 2005.